#2 Take Me To Your Leader! 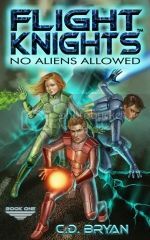 Home of Flight Knights Science Fiction Adventure Books and Fantasy Novels for Middle Grade, YA and Adult readers by award winning author C.D. Bryan. 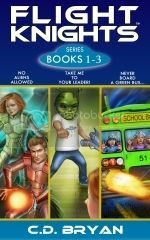 BOOK 2 – TAKE ME TO YOUR LEADER! Grab your eBook or Paperback copy by clicking one of the buttons below. Brian Parker and his best friends, Hanna Stevens and Mark Adams are on the run—again. But this time they outsmart the school bullies by crossing into a forbidden government DANGER ZONE. But they’ll be fine, right? WRONG. Parker and his friends make a Galactic discovery of a lifetime. And everything changes. Now they have BIGGER problems—MEANER and GREENER problems—and secrets to keep, and a mission to complete. Can they keep the secrets? Can they complete the mission? WACKY TEACHER – OR – ALIEN CREATURE? Lately, Parker’s little brother, Tommy, has been acting weird. Like—extraterrestrial—kind of weird. But Parker doesn’t have time for Tommy’s alien behavior. The Flight Knights are on a DANGEROUS mission. A SEARCH and DESTROY—real aliens—Mission! Wacky Mr. Mackey, the school science teacher. Alarming things are coming out of Wacky Mackey’s garage. Stellar bursts of light. High-pitched screams. Coffin-shaped space vessels. But he’s a science teacher, so no big deal, right? WRONG. It’s a VERY BIG DEAL especially when Parker spots Tommy coming out. No way Tommy is an alien. Hanna Stevens just received an EMERGENCY ALIEN ALERT during school. But school’s almost out. So, Hanna can activate her Flight Knight suit and track down the aliens. Bullies are teasing her new friend, Iris—calling her Iris-The-Virus. And that’s not all. Hanna discovers Iris has a BIGGER problem. Iris doesn’t want to ride it home alone, so Hanna decides to ride along. The Aliens will have to wait. Too bad Hanna doesn’t know what she’s getting herself into. After all, how long has she known Iris? 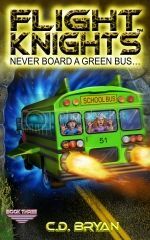 Flight Knights is to Science Fiction as Goosebumps is to Horror. 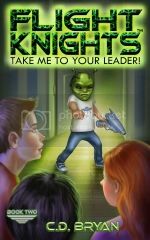 Follow Flight Knights on Twitter and Facebook for NEW Release updates and Contest Fun!!! One boy… One promise… A world of perilous adventure. When J.R. Timble wakes to discover something unnatural has happened to him, he has no idea it’s the result of a majestic event that happens every 150 years, which has also awakened fierce adversaries who come hunting–for him. But when more jaw-dropping phenomena follow, J.R. soon realizes something sinister is at hand. Overnight his simple life is shattered; a life-changing promise thrusts him into a new world of destiny, deadly peril and mystical forces. With only the clues from a mysterious local legend in the Redwood Forest, J.R. and his secret society friends must unlock and navigate an unknown realm in the real world and battle dark enemies unleashed by a villainous mastermind whose evil knows no limits. Can J.R. fulfill the prophecy of the Whiffler’s Legend? His life–and the lives of children around the world may depend on it. 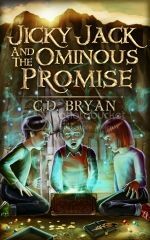 Fast-paced, humorous and amusing, Jicky Jack And The Ominous Promise is an adventurous tale that will lift you and stay with you even after you’ve turned the last page. Share book reviews and ratings with C.D., and even join a book club on Goodreads. Grab A Kindle For Your eBook Reading Pleasure!